DREAM Activist Jorge Gutierrez talks at the Hunger Strike Vigil about his experience participating in a fifteen-day hunger strike outside of Senator Feinstein’s office in Los Angeles in support of the DREAM Act. The photo was taken on August 4th, 2010. Source: Adrian Gonzalez. However, even when the majority of American voters believe that this legislation is a “no-brainer,” legislators in Washington continue to sit on their hands and keep the Dreams of students on hold. The recent introduction of the DREAM Act as an amendment to the Defense Authorization bill in mid-September was achieved because of the courage of undocumented students that are at the lead of the movement. I know the DoD bill together with the DREAM Act failed to pass cloture, but if it were not for of the work and sacrifices that undocumented youth have given to this movement, the DREAM Act would long be dead. Given the political atmosphere in this country, to obtain fifty-six votes for such controversial proposals is truly a victory. The last time the DREAM Act came to a vote in 2007, there were fifty-two votes in support of the bill. The students have learned over the years how to play in this American political circus. Undocumented youth have gained the tools to carry a national campaign to push for their DREAMs. They have taken their organizing to the next level by mobilizing other undocumented youth and allies. They have held mock graduations, had rallies outside of federal buildings, took hunger strikes to the doors of U.S. Senators. Undocumented youth have shown that their DREAMs can’t wait and have even gone to the extent to engage in civil disobedience actions in two different occasions both in the district offices of Senator McCain in Tucson, as well as in the Halls of Congress where a total of twenty-one undocumented youth peacefully, but strongly demanded for their DREAMs to be realized. The undocumented youth have not only embraced the American values as their own; they have realized that the only way for real change is by participating in the democratic system even when they are officially excluded from it. Building up for the September 21st vote, students mobilized and generated over 350,000 calls to the Senate for the DREAM Act. After the failure to pass cloture, undocumented youth understood that the campaign was not over, and that they still have a chance to push the bill in the lame-duck session. In the mean time, registering voters and encouraging allies to vote in the November elections through the campaign Vote4Me becomes crucial to secure the victory before the end of the legislative cycle. Another way to measure the visibility of the immigrant youth political capital is by the recent statements of Senate Leader Harry Reid. As the elections come to a close, Reid (D-Nevada) has stated that he will introduce DREAM Act to a vote in the lame-duck session. Some see this as one more of the political moves to secure Reid’s very difficult re-election against Republican and Tea Party favorite Sharron Angle. Though, DREAM Activists see this as reassuring and a statement that will create leverage in the post-elections session. DREAM activists are ready to hold him and every other Senator that has expressed support for the bill accountable and will not let their DREAMs die one more legislative cycle. Following the traditions of the civil rights movement of the 1950’s and 1960’s, undocumented youth have finally come out and said that they are Undocumented and Unafraid. 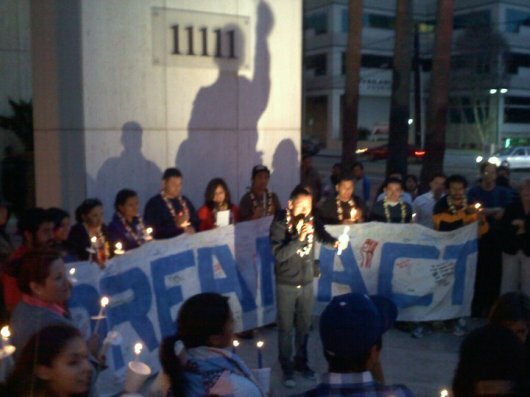 Undocumented youth are tired of “waiting”, and can only breathe action. Come out to vote with the Dreams of thousands of undocumented youth in mind. Come out to vote with the new generation of Americans in mind. Carlos Amador is a Masters of Social Welfare student at the University of California, Los Angeles. He was born in Mexico and came to the U.S. with his family after his dad lost his twenty-five year-old professional job in one of the main banks in Mexico. Carlos has grown up attending U.S. public education institutions. He has been involved in the struggle for undocumented youth for several years. Carlos is a member of DREAM Team Los Angeles and IDEAS at UCLA, where he has been working for the passage of the DREAM Act. He, as many other undocumented youth, has reached a point where he is Out, Undocumented and Unafraid. He ultimately wants to work with disadvantaged communities, empowering them and helping them build a more just, economic and social place to live in. Thank you for posting this, Carlos. Your courage to take a risk, stand up, and speak is truly incredible and inspiring. It recalls Civil Rights struggles and from my own family’s experiences, it reminds me of the fact that citizenship can be fickle, revoked at the will of stereotypes and fear. My mom’s side of the family is Japanese American, and during WWII went from legal citizens one day to internment inmates the next. Many Japanese lost their citizenship for refusing to fight in the war (There’s one great story about a man who was lived as if he were stateless for years afterward in the film The Cats of Mirikitani). I hear your message of refusing to “wait” to be treated equally and love the MLK quote. It is true– there is no better time for equality than now. Thanks again for this post. I am thinking a lot about the Dream Act today. America should be paving the way for its smartest, hardest working students.